Long Beach's "Flood Control" is an extinct spot that used to exist at the mouth of the Los Angeles River, before it was ruined by the construction of the Long Beach Harbor. This wave was ideal for the biggest of Summer's South swells. ... Ink Well Beach, the 200-square-foot portion of Santa Monica State Beach that was once roped off and reserved only for African-Americans, will soon be awarded its own commemorative plaque by the City. The City Council directed staff last year to research options for creating a plaque in honor of Ink Well Beach and surfer Nicolas “Nick” Rolando Gabaldon, who is historically considered to be the first African-American surfer. Rhonda Harper, an African-American female surfer, asked the City to install the plaque because many African-Americans and other minorities still frequent the former Ink Well Beach site between Bay and Bicknell streets south of Santa Monica Pier. She said many beachgoers have no idea about the history behind Ink Well Beach or of the Gabaldon legend. “There are two heroes here in Santa Monica that have not been recognized -- Nick Gabaldon and the Ink Well Beach,” Harper said. Harper said she surfs in Los Angeles, Hawaii and Costa Rica, among other sites. Currently, the Ink Well Beach site is home to a storm drain and a Millennium Tree that comes with a plaque. However, the tree plaque does not identify the location as a popular beach hangout for segregated African-Americans. A new bronze plaque, approximately 20-by-24 inches, will be mounted on a large boulder and placed in a landscaped area adjacent to the intersection of the bike path and the boardwalk that extends out onto the beach. The location was selected to offer the public an opportunity to learn about one historical aspect of one specific stretch of the beach without impacting existing landscaping, said Jessica Cusick, Cultural Affairs manager. "The beach near this site between Bay and Bicknell Streets, known by some as the Ink Well, was an important gathering place for African-Americans long after racial restrictions on public beaches were abandoned in 1927. “African-American groups from Santa Monica, Venice and Los Angeles, as early as the 1920s to the end of the Jim Crow era in the 1950s, preferred to enjoy the sun and surf here because they encountered less racial harassment than at other Southland beaches. “In the 1940s, Nick Gabaldon, a Santa Monica High School student and the first documented black surfer, taught himself how to surf here." Gabaldon was born February 23, 1927 in Los Angeles and is actually of African-American and Hispanic descent. He lived most of his life in Santa Monica and was one of 50 African-American students to attend and graduate from Santa Monica High School in the 1940s. As a teenager, he learned to surf at Ink Well Beach with a wooden surfboard borrowed from a friendly Caucasian lifeguard. In the 1940s, roughly 2,000 African-Americans lived in Santa Monica and created a thriving community of well-attended churches and successful businesses at the neighborhood end of Ink Well Beach. Lloyd C. Allen became Santa Monica’s first African-American millionaire with his Allen Janitorial Supply business, which opened in 1949 at the corner of Fourth Street and Pico Boulevard. After graduation, Gabaldon joined the United States Navy and fought in the last months of World War II between 1945 and 1946. With his Navy enlistment over, he returned to Santa Monica in 1946 and enrolled in Santa Monica College. 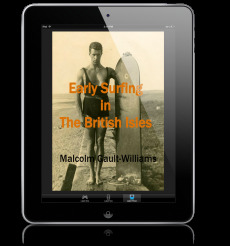 He spent his time studying at the local college and honing his surf skills with better surfboards at Ink Well. The waves were higher and more challenging at Malibu’s Surfrider Beach, Gabaldon learned in 1949. 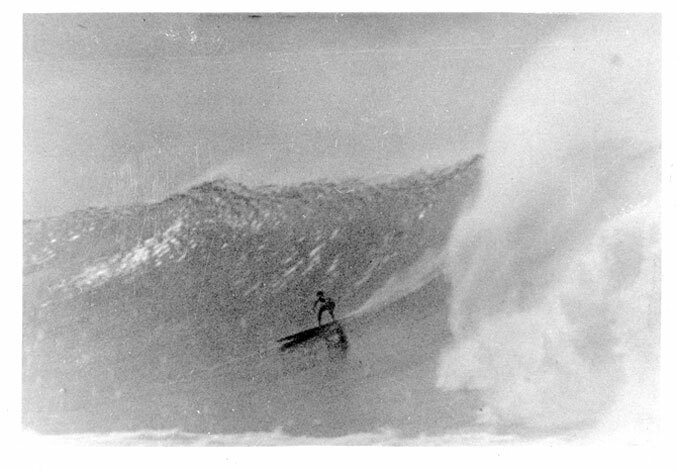 Other legendary surfers of the 1940s and 1950s such as Ricky Grigg, Matt Kivlin, Mickey Munoz, Bob Simmons and Buzzy Trent were in awe at Gabaldon’s Malibu surfing abilities and counted him as their close friend. He made Surfrider Beach his surfing home, but initially had difficulty making the 12-mile trip north from Santa Monica. Not owning a car, he tried to hitchhike along the Pacific Coast Highway, but most drivers refused to stop for the tall, muscular African-American man. Gabaldon found a novel way to reach Malibu -- by paddling on his surfboard across Santa Monica Bay nearly each day until his untimely death at age 24. He died on June 6, 1951 when he slammed into the Malibu Pier after riding a strong south swell estimated by witnesses to be 10 feet high. His surfboard was found immediately, but his body washed ashore on Las Flores Beach a few days later and is now buried at Santa Monica’s Woodlawn Memorial Cemetery. The Gabaldon legend continues after the discovery of an ominous poem, “Lost Lives,” which he wrote on May 31, 1951, six days before he died at Surfrider Beach. Come you clapping, rapping with a mighty roar.